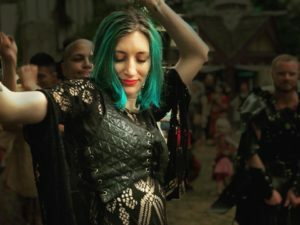 This summer, I forged a deeper spiritual connection with the Bristol Renaissance Faire, where I act on the weekends. The Faire, located just north of the Illinois/Wisconsin, recreates the city of Bristol in 1574. As I have discussed on my blog, Bristol is a place of strong magic, like Middle-earth, possessing a powerful spiritual force. Throughout the summer I commented on Facebook about Bristol’s spiritual pull even though I don’t expect everyone to understand what I’m talking about. Here are some of those posts culled from my Facebook page. 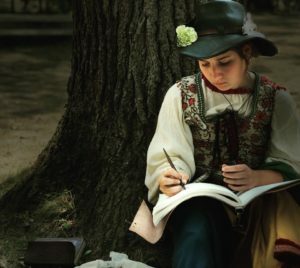 I hope the words inspire you to find your own place of magic. It’s one thing to get comfortable being uncomfortable, but quite another to dive into a terrifying abyss. 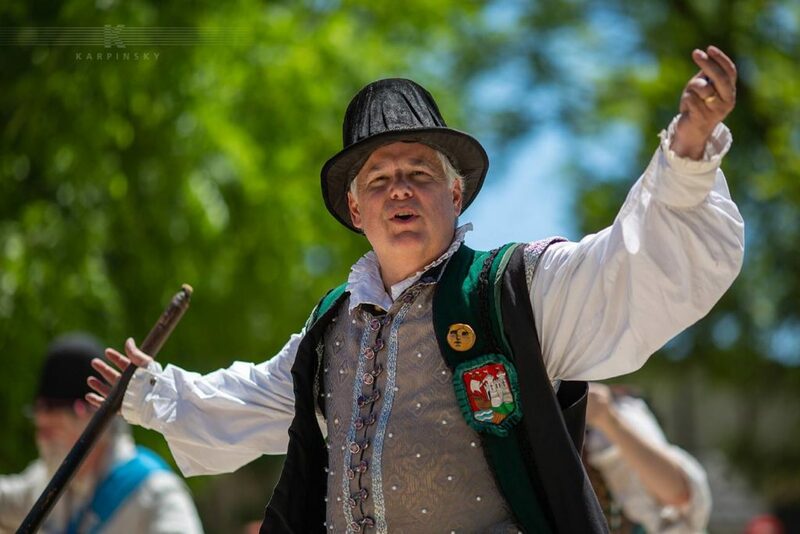 On Sunday, performing as my Sir Nicolas Wright, I jumped up on a small stoop in the crowded Sun Garden of the Bristol Renaissance Faire with absolutely no game plan. I did so to force myself to get better at onstage improv. (I am far more comfortable with improv on the street in small groups.) I felt several eyes staring at me with “What is this guy doing?” looks. With the help of castmate and friend Kendal Monaghan, I just started riffing by reading people in the audience and reacting to their reactions. We ended up putting one patron on a mock trial for the crime of dragging a dead whale down the streets of Bristol. 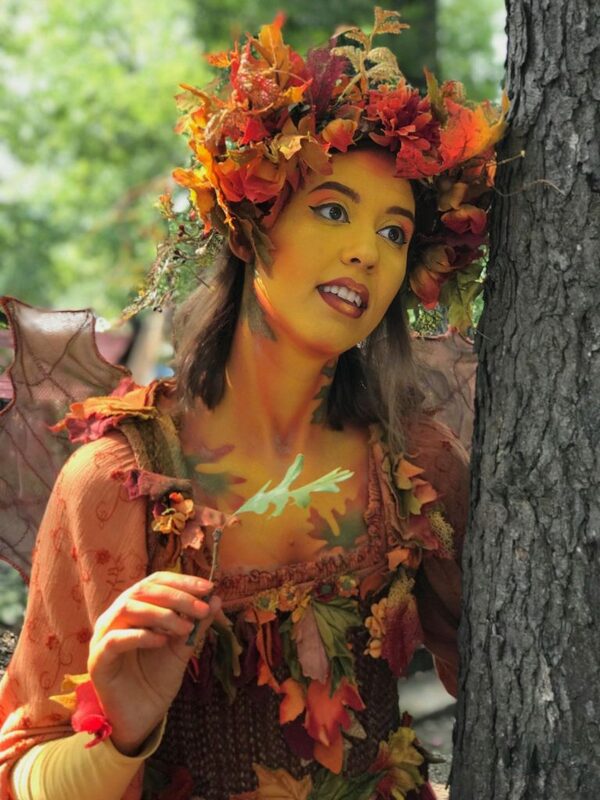 There is strong magic in Bristol that makes us do crazy, fun, and challenging things that reverberate in our souls, but the magic dust floats through the air for only nine weekends. We need to make each one count. On Sunday morning at the Bristol Renaissance Faire I was in character as Sir Nicolas Wright when I photographed a friendly couple (pictured above) as they waited for their children to finish shopping. Later in the day, I came across the couple with their family of eight young men and women sitting on a circle of benches on High Street. I sat with them awhile they all eagerly shared their purchases with me. Isn’t Bristol a magical place, I asked? Then we all took turns describing what magic means to us – the magic of breathing the air tinged with the aroma of wood smoke and a hint of incense, of hearing fiddles, drums, and perhaps a hurdy-gurdy playing nearby, and of having serendipitous encounters with new friends like the one we were having. 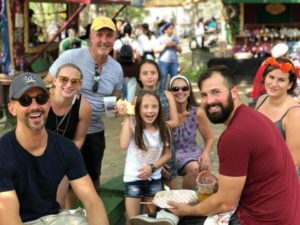 We agreed that places of magic bring out our best selves, and we must savor these brief moments of camaraderie with strangers who become friends, for we may never see each other again. An hour later, I was dancing in the drum jam near the Fountainside Music Stage, when I heard a voice yelling, “Nicolas Wright!” I glanced up, and there was the family, standing in Farnham Way, waving. And then they were gone. One more moment of magic. I am sometimes asked how I have the energy to dance in the Bristol drum jam after being on my feet all day running around the town being Nicolas Wright. I draw strength from the shaman. The shaman breathes fire in the eyes of the drum jammers and speaks truth in the sound of the drums. The shaman is in the grass at my feet and in the birds above. The shaman creates a magical energy out of the air that buoys the soul. Later in the day, Sir Nicolas and the guy wearing the Black Sabbath T shirt traded stories about our favorite Black Sabbath concerts and about the brilliance of guitarist Tony Iommi. A 16th Century barrister has no knowledge of Black Sabbath or Kanye West. So, I am being historically inaccurate by discussing my enthusiasm for these artists. But I’m also uplifting these patrons by complimenting them on their musical tastes and creating a deeper moment by bonding over our favorite songs. Always choose to uplift even if you need to bend time. Bristol teaches us to believe. 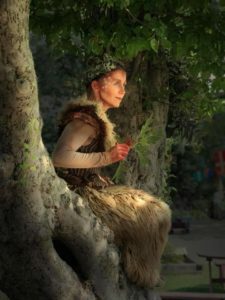 When people walk through the gates of Bristol into the recreation of a 16th-Century village, they are not playing make-believe, and neither are the cast. We are all embracing a willingness to believe. We want to believe in the kindness of other people, that we can smile as we pass each other in the street for no other reason that we are worthy of each other’s love. We want to believe that a family lounging in the grass of Shakespeare’s Meadow will invite you to sit down with them and share their lunch. That a lute player will play a song that makes you forget the cares of the world. That when you are tired, a pirate in the Friends of Faire garden will fill your mug for you. That dancers in a drum circle will welcome you with open arms even if your idea of dancing is to flail around crazily. That you can flourish without judgment. Our belief that Bristol can bring out everyone’s best selves gives us the courage to be kind to strangers. There is a strong kind of alchemy at work here, and I’d like to think that magic changes us long after the gates are shut come September. We have five more days to breathe the air that deepens belief. Look around you this weekend and love one another. Music unifies strangers. On Saturday at the Bristol Renaissance Faire, I noticed a guy in the yellow cap (pictured above) was casually singing a verse from the song “The Weight,” by the Band. In character as Nicolas Wright, I completed the verse as I strolled by. He ran up to me and began singing more of the song until we completed verses together. Then we shared the memory of the song being used in the soundtrack to “Easy Rider,” and he brought me and Kendall Monaghanback to meet his family. The moment itself reminded me of the scene in “Easy Rider” where a rancher invites Billy and Captain America to his home. What a happy group. 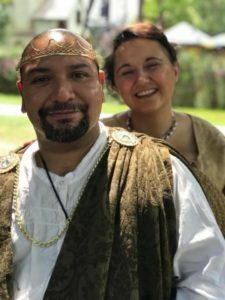 On the last day of the Bristol season, I recorded a personal greeting for the Bristol Renaissance Faire Facebook page as cast members do each weekend. Normally I record everyone’s greetings. Kendall Monaghan recorded mine. I did the message in one take, and then Kendall and I walked back to our cast dressing rooms. Just as we were about to part company, I told Kendall, “Wait. Let’s head back and record it again. I told our guests to breathe the Bristol air. But the Bristol air is magic. I need to tell them to breathe the magic air.” Fortunately Kendall has gotten used to me. She thought the first take worked but agreed to do it all over again or else I’d be obsessing about not saying exactly what I wanted to say. She needed to get ready for the day but headed back to the recording spot to do the take until I mentioned the magic air. Including the word “magic” in a 20-second message might seem trivial. But not to me. For Bristol has cast a strange, mystical spell on my heart. Find a place that does the same for you and never let go. 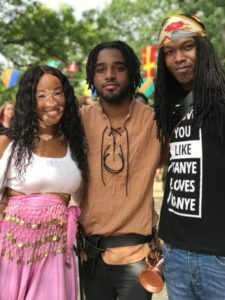 This entry was posted in Entertainment and tagged Bristol Renaissance Faire, David Deal, Nicolas Wright, Sir Nicolas Wright. Bookmark the permalink.